I spent this weekend in Chicago visiting an old friend and her girlfriend. I've been reluctant to travel about the united states, I tend to assume that all American cities are the same. I've always known better but this time instead of traveling outside the United States I traveled up to the great lakes. It's amazing how much of an impact certain sights affect you once they're experienced in person. Slide after slide and class after class, I've learned about these architects and their buildings all around the world. I remember distinctly the first time I saw the American Radiator building in New York City, and my education finally seemed to click into relevance---at least in terms of architectural history. 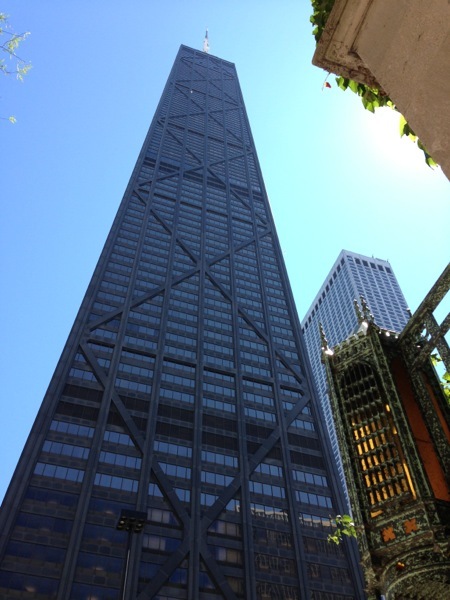 This time in Chicago, I saw first hand the work of Sullivan, mies van Der rohe, Frank Gehry, and Frank Lloyd Wright. Although I repeat some of these designs much much more than others; it was an honor to experience their pavilions and impact on the building design industry today. In addition to the arhitectural marvels, concretized slides, and visiting an old friend in her neighborhood we also got to travel to lollapalooza. I heard the voices of Teagan and Sara, Cat Power, Liana de Havas, Wild Belle, and a few others. This wa my first time to a music festival but it will definitely not be my last.